Nine of the top 10 busiest hubs were in Albany, with Hudson River Parkway - Corning Preserve leading the way. The Saratoga Spa State Park was the top hub in Saratoga Springs; Proctors Theatre (Jay and State Streets) was most popular in Schenectady; and the corner of Hill Street and Liberty Street, adjacent to Prospect Park, was the top hub in the Collar City. 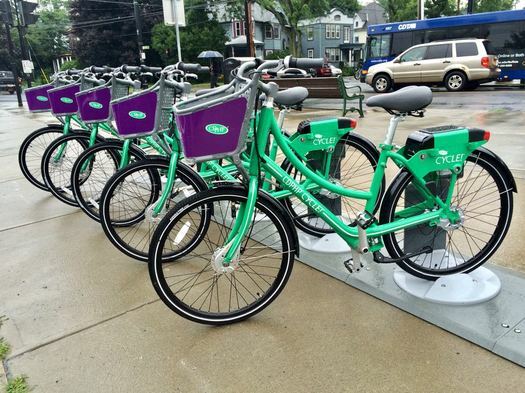 The bike share is scheduled to run through the end of November, weather permitting. CDTA's planning to roll it back out next April with 160 more bikes and additional hubs. I think that ridership isn't booming in Troy because a lot of the places that people more or less need to get to (Doctors offices, Supermarkets, HVCC) all require taking difficult uphill rides. Also anywhere downtown is almost too readily accessible by foot, so a bike isn't needed. I think they need a bike location in South Troy, which has a lot of people without vehicles, but walking to the nearest bike location for them is basically as far as walking to where they need to go. It would be really great for people to be able to bike from North or South Troy into Downtown where a lot of people without vehicles take buses outside of Troy. A bike location right near the two major downtown bus stops would be a smart move, I think.